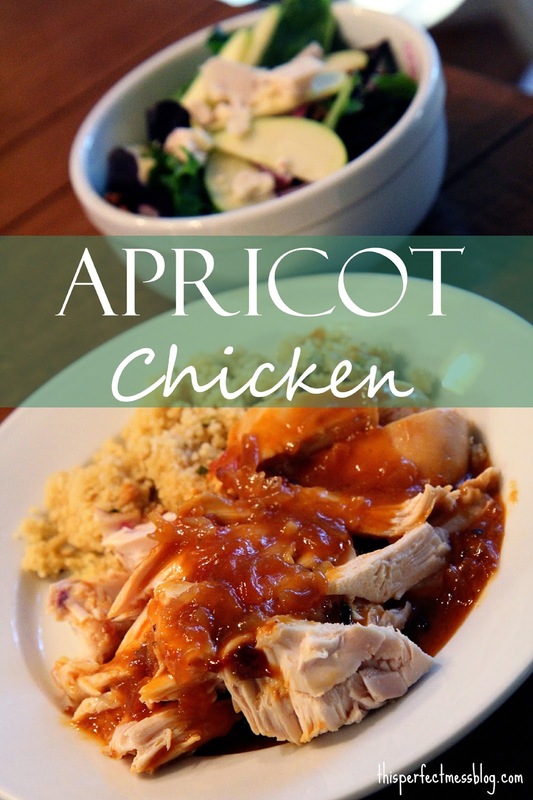 Apricot Chicken is a classic recipe, sure to be found in many old church cookbooks. It was one of my mom's "go-to" recipes when I was growing up, probably because it was one meal that my picky sisters and I would actually eat. That, and because it takes, like, 5 minutes to throw together. Variations of this recipe, sometimes called Russian Chicken, are floating all over the internet. Some say use thighs, some go the boneless, skinless route. Some throw theirs in the crockpot, others do the oven. Here is my take, adapted for the freezer. With only 4 ingredients, this dish is a cinch to throw together! Mix 1 packet of onion soup mix, a jar of apricot preserves and a bottle of Russian dressing in a zip top bag. Then add 3-4 bone-in chicken breasts with the skin removed. Why bone-in chicken? In this dish, the sauce needs time in the oven to reduce and come together. Boneless chicken breasts cook quickly and will end up dry before the sauce is finished. Using bone-in chicken (look for "split chicken breasts" at the grocery store) will allow the meat to stay juicy and tender while the sauce reduces to a thick, tangy glaze. BUT! Make sure you to REMOVE the skin from your chicken breasts. In this recipe, since the chicken is baking in a pool of glorious sauce, the skin will become a hot, soggy mess. And nobody wants that. Plus, it saves calories! Ta da! This baby is ready for the freezer! Pour your thawed bag of Apricot Chicken into a 9x13 baking dish. Line it with foil to save on cooking time. After about 55 minutes in a 350 degree oven, dinner is done! Sweet, juicy, tender. Your family's gonna love it. This recipe is also very forgiving; you can substitute any citrus-y jam or any red-based dressing. What's hanging out in your pantry? Orange marmalade and French dressing? Throw 'em together, it'll be delicious! Mix the dressing, preserves and onion soup mix in a zip top bag. Add the chicken and turn to coat. Freeze! Thaw chicken completely. Preheat oven to 350 degrees F. Line a baking pan with aluminum foil for easier clean-up. Place chicken into the baking dish, bone side down. Bake uncovered for 50-60 minutes, or until chicken is cooked through. Serve the chicken over rice or couscous and spoon sauce over the top. Add a green veggie or salad on the side!